From gostanford.com --- MARANA, Ariz. - Stanford's hopes of capturing the Callaway Collegiate Match Play Championships came to an end today as the Cardinal suffered a 3-2 defeat at the hands of USC in the second round of the event being held at the Ritz Carlton Golf Club in Marana, Ariz.
Joseph Bramlett and freshman Steven Kearney accounted for Stanford's only two wins on the day. Bramlett defeated Matthew Giles, 1-up while Kearney downed Stewart Hagestad, 3 and 2. The Trojans posted three wins at the top of the lineup. T.J. Vogel earned a 2 and 1 victory over Sihwan Kim, Steve Lim bested Steve Ziegler, 4 and 3 while Martin Trainer scored a 1-up victory over freshman Andre De Decker. Top seed Stanford beat Indiana 3 & 2 behind victories by Sihwan Kim (2 and 1), Steve Ziegler (3 and 2) and Steven Kearney (1 up). In the uniqueness that is match play, despite losing 3 & 2 Joseph Bramlett had the best first round scoring of any Cardinal player. Next match is against Pac 10 rival Southern Cal which didn't get completed and will be finished up on day 2. Southern Cal was leading 2-1-2 well into the 2nd round --- the two tied matches of Bramlett and DeDecker will swing the result one way or the other. Once again Bramlett has played the best but again has run into a hot opponent. STANFORD, Calif. - The second-ranked Stanford men's golf team has earned the top seed at the Callaway Collegiate Match Play Championships which will be held March 21-23 at the Ritz Carlton Golf Club, Dove Mountain in Marana, Ariz.
Stanford will meet 16th-seeded Indiana in Sunday's first round match beginning at 8:00 a.m., with the winner advancing to take either eighth-seeded USC or No. 9 TCU in the second round later in the afternoon. Arizona State, the fourth seed, will tee off against Iowa, while fifth-seeded UCLA will meet Colorado State to complete the top half of the bracket. Texas A&M, seeded third, will battle host school Arizona with the winner advancing to face the victor of No. 6 UNLV and No. 11 Middle Tennessee. Seventh-seeded Texas Tech will square off against San Diego, while No. 2 Washington will meet New Mexico in the first round. Third round matches will be contested on Monday while the championship and consolation matches are slated for Tuesday. Head coach Conrad Ray is expected to send out a lineup consisting of senior Joseph Bramlett, juniors Steve Ziegler and Sihwan Kim along with freshman Steve Kearney and Andre De Decker. It will mark Bramlett's second event of the season, as the talented senior had been sidelined with a nagging wrist injury for the better part of the last two years. He made his season debut earlier the month at the USC Collegiate Invitational, where he finished tied for 16th. Having Joseph Back has been great," said Ray. "He has been playing solid and his best golf is ahead of him. He brings leadership and intensity which we need." Ray is also anxious to see how Kearney and De Decker perform in this marquis event. "I'm excited for Steven and Andre to get a shot in the line-up. Both have been working hard and are competitive and it speaks to our depth that they are able to qualify at this point in the season." The Ritz-Carlton Golf Club, Dove Mountain a desert golf layout which is the home of the Accenture Match Play Championships, opened in January 2009. The course features elevation changes from 2,300 to 3,000 feet, and distinct character that blends naturally among majestic saguaros that stand along the surrounding Tortolita Mountain Range. 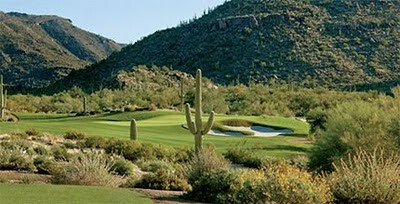 Jack Nicklaus' first in the Tucson area in 25 years, the 27-hole Dove Mountain facility offers three distinct nines - the Saguaro, Tortolita and Wild Burro. The Callaway Collegiate Match Play is to be contested on the Saguaro and Tortolita nines, just as is the Accenture Match Play Championship. They form a par 72 that measure 7,833 yards. After missing nearly two years because of injury, Joseph Bramlett was understandably concerned about being able to compete against the top collegiate golfers in the country. But that's the advantage of being on the Stanford men's golf team: Just to get into a tournament, you have to compete against the nation's top college golfers. Cardinal golfers must qualify for each tournament by beating out their teammates, virtually all of whom were All Americans as juniors. "As much as I was stressing out about qualifying, by the time I got to (the tournament), I was much more relaxed," said Bramlett, now a senior. "It pushed me to make sure I was ready." Bramlett, from Saratoga, proved he was ready this week when he tied for 16th at the USC Collegiate in Westlake Village. It was the top finish for the Cardinal, which placed a disappointing ninth against a strong field. But there was no disappointment from Bramlett, who shot a first-round 3-under-par 68 and followed with a 73 and a 71 at North Ranch Country Club. It was his first competition since 2008. Two separate injuries to his right wrist limited Bramlett to just nine tournaments over the past two seasons. This after a freshman season that saw the St. Francis High product post one of the 10 best scoring averages in Stanford history (71.5) and help the Cardinal to an NCAA title. MORE --- click here to read the rest of the article. Here are full results from Bramlett's first tournament back since 2008. Stanford finished a disappointing 8th at the USC Collegiate but the big news was the return of senior captain Joseph Bramlett, who led the team in scoring, in his first event since the fall of 2008. Joseph had rounds of 68-73-71 to tie for 16th at 1-under par. The team led after the first round by 1-shot firing a 278 total behind Joseph's 68 and all four other Cards shooting 1-under 70s. The 2nd round was 14 shots higher at 292 as Stanford slid to 8th and a final round 285 total kept them in 8th position, 24 shots behind the red-hot Oregon Ducks. Stanford's lineup also included Sihwan Kim, Steve Ziegler, Andrew Yun and Graham Brockington. Playing as a freshman was Andre De Decker from South Africa. Andrew had rounds of 70-73-71 (T25), defending individual champion Steve Ziegler shot 70-74-71 (T31), Graham shot 70-72-73 (T31) and Sihwan shot 70-74-73 (T33). Andre shot 82-77-71 (77th). A healthy Bramlett gives hope for an even stronger, deeper team for the 2nd ranked Cardinal. Missing from action for the first time since he came to the Farm, was sophomore David Chung who came down with strep throat. The USC Collegiate was played at North Ranch CC in Westlake Village. Live scoring by Golf Stat is provided. Stanford won last year's tournament by 10 shots with a record score and Steve Ziegler captured the individual title for his first collegiate win shooting a 65 in his final round -- a summary of last year's tournament can be found here. The 14-team field includes Arizona State, BYU, California, Fresno State, Oregon, Oregon State, Pepperdine, San Diego State, Stanford, UC Davis, UCLA, UNC Charlotte, USC, San Diego. Play begann with 36 holes Monday with a shotgun start at 7:30 a.m., followed by 18 holes on Tuesday, starting at 7:30 a.m. (with starting times off both nines). The course plays to a par 71 at 6,869 yards. General info on the tourney is provided on the host website by USC.